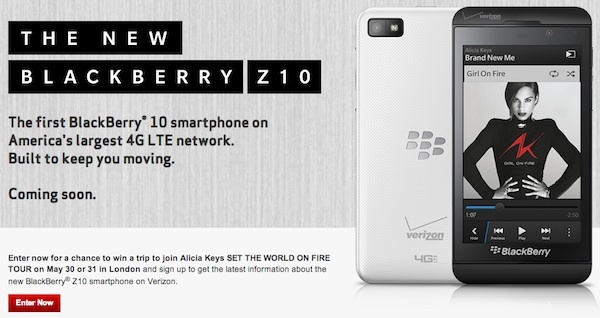 Enter the 'BlackBerry Z10 Keep Moving with Alicia Keys' sweepstakes to win a trip to London or a BlackBerry Z10! We've heard all about Alicia Keys and the BlackBerry Keep Moving Projects, and now AT&T, Verizon and T-Mobile have teamed up in the BlackBerry Z10 Keep Moving with Alicia Keys sweepstakes. As her tour kicks off today, fans across the globe can enter to win the "Alicia Keys VIP Experience" where they'll be flown to London to see a live performance, meet Alicia in person and walk away with a new BlackBerry Z10. A total of 12 grand-prize winners will be chosen (four per carrier) to attend the London concert on May 30 or 31 and will receive two new BlackBerry Z10 phones. 600 first-place winners will also win a new BlackBerry Z10. All you need to do to enter is fill out the entry form for your carrier below between now and March 20th. A random draw to pick the winners will take place on or around March 27th - that's all there is to it!